Nauert has been on the short list for ambassador to the UN since Haley announced that she was stepping down from her post in October. US President Donald Trump plans to nominate State Department spokesperson Heather Nauert to replace Nikki Haley as his new ambassador to the United Nations. Trump is expected to make the announcement Friday morning, sources told CBS News. Nauert has been on the shortlist for ambassador to the UN since Haley announced that she was stepping down in October. Formerly a Fox News anchor, Nauert came into the administration in 2017 with no prior government experience. She will have to be confirmed by the Senate to secure her position, where Democrats will likely grill Nauert on her qualifications for the position. 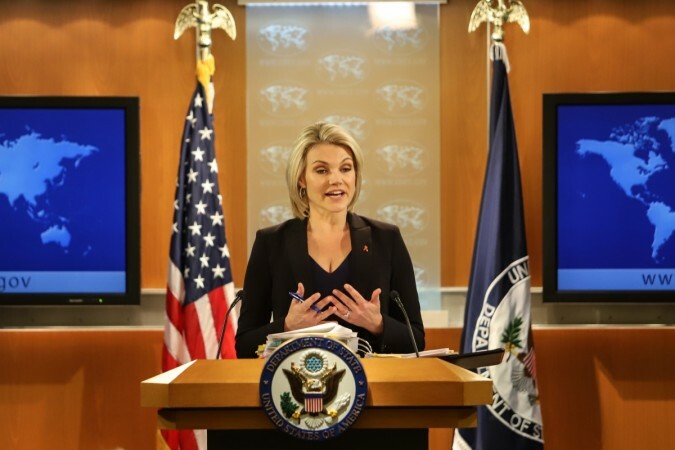 In her new role, Nauert would be responsible for maintaining international support for economic sanctions against North Korea and continuing the Trump administration's unflinching support for Israel in the face of mounting scrutiny at the UN, reports The Washington Post. A former news reporter for ABC, Nauert joined Fox in 1996, originally as a correspondent and later as a co-host for "Fox and Friends". Nauert has earned a reputation of being a relentless defender of Trump through the turbulent tenure of the administration's first Secretary of State, Rex Tillerson. A senior administration official told the Post that Nauert would be "an outstanding advocate for the American people at the UN". "She's hard-working, she's smart and she never gives up in advancing an agenda that works for the US," the official said.